The beloved story of the March girls is a classic American novel, telling the story of four sisters: independent, tomboyish Jo; delicate, loving Beth; pretty, kind Meg; and precocious, beautiful Amy, the baby of the family. The charming story of these four "little women" and their wise and patient mother Marmee enduring hardships and enjoying adventures in Civil War New England was an instant success when first published in 1868 and has been adored for generations. Bringing together traditional handicraft with cutting-edge book design, the Penguin Threads series has already created a huge buzz among the art and book-collecting communities. This latest set features cover art by painter and illustrator Rachell Sumpter, who brings a unique, whimsical sensibility to the Threads. With vivid colours and ambitiously intricate details, these additions to our innovative series commissioned by award-winning creative director Paul Buckley are rich works of art to be cherished and shared. 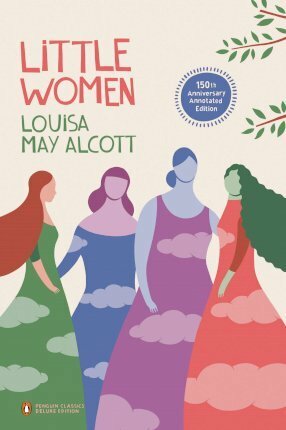 "Perhaps no other book provided a greater guide, as I set out on my youthful path, than Louisa May Alcott's most beloved novel, Little Women." "I have always gravitated towards the cozy book, and nothing is cozier than Little Women. It was one of the books that fostered my love of America, very early on, and showed me what makes a great character, particularly in headstrong Jo." --From the Foreword by Patti Smith "I have always gravitated towards the cozy book, and nothing is cozier than Little Women. It was one of the books that fostered my love of America, very early on, and showed me what makes a great character, particularly in headstrong Jo." Louisa May Alcott was born in Pennsylvania, in 1832, the second of four daughters. After a period of serving as an army nurse, she published Hospital Sketches in 1863, followed by Gothic Romances and lurid thrillers. In 1868-9, she published Little Women, which proved so popular that it was followed by two sequels and several other novels. She died in 1888.